Nose: Gravel, jarred applesauce, lychee nut, bottled lemon juice. Palate: Dry and medium bodied. Meyer lemon and mineral water. Finish: Short, clean and dry. A little bitterness and minerality with a spritz of acid. Parting words: I had the privilege of wandering around the famous Block II a couple weeks ago with three of my best friends. It’s a noble, old stand of Riesling with soil is so sandy that I felt like setting up a volleyball net. As our guide told us, the sand is very important. It retains very little water, so the vines are forced to send their roots deep. This stresses the plant, and leads the plant to focus more on reproduction (fruit) than producing leaves and stems. Many also believe that greater root depth leads to more complex wine, since the roots are drawing minerals from a greater volume of soil. Whatever the role of terroir, this is a very tasty dry Riesling that is still drinking well given its age. There’s not a lot of fruit or flowers left here, but what there is keeps the acidity and minerality from overrunning the glass. The few reviews I was able to find of this wine were from 2012 and there seems to have been a lot more going on back then. Even with the lack of complexity, this is still a good dry Riesling at this price. 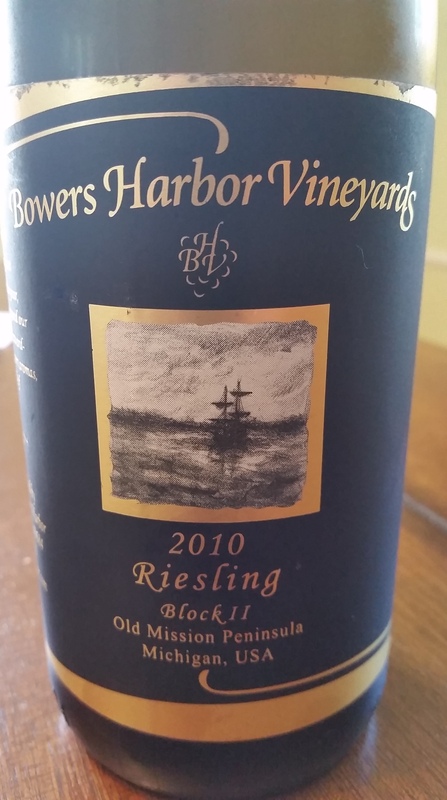 2010 Bower’s Harbor Vineyards Block II Riesling recommended. If you have one in your cellar, drink now, with food or without! Grapes: Cabernet Franc, Merlot, various red French hybrids. Nose: Mixed berry jam, white pepper, touch of oak. Palate: Medium bodied and medium dry. Strawberries, sweet cherries, blackberries, oak. Finish: Drying with black cherry and blueberry jam. Fading into chewy tannins. Parting words: I picked up this wine a few days ago while looking for an easy-drinking, casual table wine for a cookout I have annually. I bought the wrong thing, but in a good way. The words “table wine” on the label threw me off. This is a table wine in the sense of a wine that goes well with fine food, not in the sense of a cheap wine to drink on a weeknight or serve at a party with people who don’t care about wine. 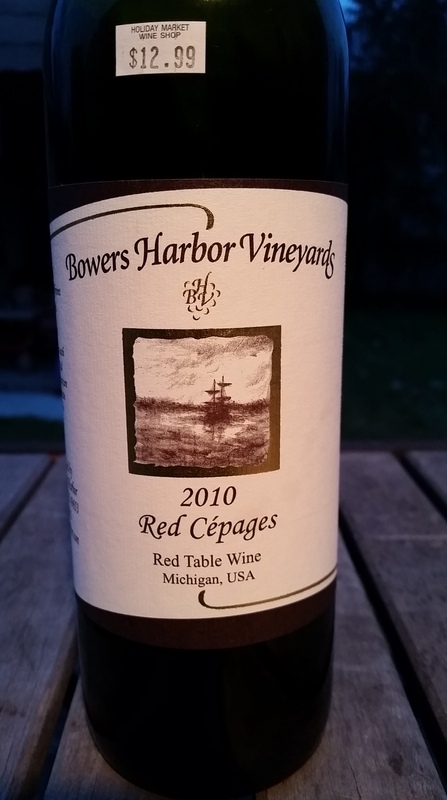 Bower’s Harbor Red is actually their (successful) stab at a Bordeaux/Meritage style blend. It has everything one expects in a blend like this, even though it is a little fruit heavy at this stage. That get me to the only negative thing in the review. Not enough time in the bottle. If I had done a little research in the store, I might have let this one sit in the cellar for a few years before cracking it. Even at this age, Bower’s Harbor Red 2013 is recommended. Appearance: Brick red with long thick legs, pretty close together. Nose: Semi-sweet and jammy. Black cherry jam, cedar, a touch of foxiness. Palate: More tart than the nose would suggest. Blueberry jam, blackberries, oak. Finish: Chewy and sweet. Wild blackberries, leather, a bit of tartness. Parting words: This wine was a bit of a surprise to me, but it shouldn’t have been. It was sweeter than I expected but still has enough underlying structure to keep it from falling into pop wine territory. It seemed more like a table wine to me than the French-style red blend I was expecting. I should have looked more closely at the label, because it says right under the boat “Red Table Wine”. The price is a little more than I like to pay for table wines, but I liked it over all. It did OK with our supper of homemade macaroni and cheese. My wife said that she prefers that style of wine in the summertime, and I can’t disagree with her there. Red Cépages works best as a casual warm weather sipper. As such, it is recommended. Nose: Lychee, white peach, pear, whiff of dried flowers. On the palate: Medium bodied and slightly tart. Queen Ann cherries, white mulberries, rose water. Finish: Fairly dry with a hint of tartness. Pear, plum and Golden Delicious apple. Parting words: Is orchardy a word? Because if it is, it applies to this wine. I don’t usually buy into claims that terroir makes much of a difference beyond soil composition and climate, but this BHV’s Medium Dry Riesling is very much in the spirit of Northern Michigan. Cherries and other stone fruit are abundant with a bit of apple and pear thrown in there as well. Starts to get overly tart after being opened for a day or more, but this one is so tasty it should not be a problem to finish a bottle within 24 hours. The dryness makes it quite food friendly and it would go very well with mild flavored fish (the label recommends Walleye) and chicken. Bowers Harbor Medium Dry Riesling is highly recommended.